Regency Outdoor billboard along I-5 freeway south of downtown L.A.
Regency Outdoor, a West Hollywood billboard company that sued the city after being denied permits to put up new billboards in 1999, has agreed to drop the long-running federal court suit in exchange for $2.1 million. The settlement was made with the city’s Community Redevelopment Agency (CRA), which had refused to allow Regency to put up new billboards in redevelopment zones in the Hollywood and Exposition Park area. Regency had initially sought $10 million in damages, but in 2008 a judge dismissed that claim and awarded the company $14,000 in reimbursement for costs incurred in applying for the permits. Regency appealed that decision, and in 2010 the 9th Circuit Court of Appeals decided that Regencycould pursue its claim for damages. The CRA is currently in the process of going out of business, as part of the state-mandated dissolution of redevelopment agencies and re-direction of their tax revenues to state and local governments. Ostensibly, the $2.1 million will be paid out of the CRA treasury, rather than the city’s general fund. The actual cost of the lawsuit could exceed $3 million. According to city records as of March, 2010, the CRA had paid almost $700,000 to outside law firms hired to represent the agency. The lawsuit is one of several high-profile cases brought by Regency against the city. In 2003, the company won a judgment in federal court forcing the city to allow supergraphic signs along the 10 freeway and elsewhere. Company lawyers had argued that by allowing murals painted on buildings the city had to also allow commercial advertising. As a direct result of the lawsuit, which threatened to open up the city to an unlimited number of the building-sized vinyl and fabric ads, the city council approved a ban on any new murals. Regency also sued the city for damages over the planting of palm trees at LAX, claiming that the trees interfered with clear views of several of the company’s billboards. That case went all the way to California Supreme Court, which ruled in 2006 that the city was within its rights to plant and maintain the trees in the public right-of-way. There were also allegations at the time that Regency had been responsible for the poisoning of some of the trees, but an investigation by then-City Attorney Rocky Delgadillo found no evidence of wrongdoing by the company. 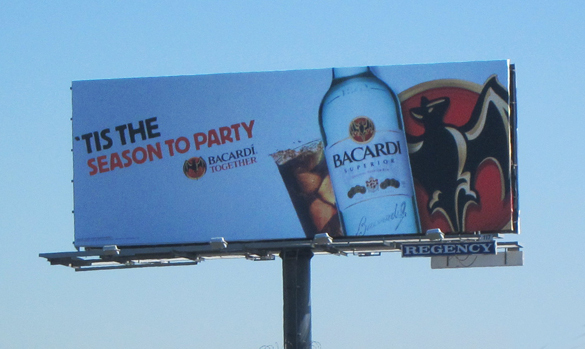 Regency has also been involved in a number of lawsuits this past decade involving other billboard companies. Late last year, a federal court jury found Regency innocent of allegations of bribery of public officials and extortion in a dispute with another billboard company over the granting of sign permits in the city of Lynwood. But just two weeks ago, a judge ruled that Regency was liable for $2 million in damages in a case involving the Whisky A Go Go nightclub on Sunset Blvd. in West Hollywood. The lawsuit brought by the club and another billboard company alleged that Regency had refused to remove its two billboards from the roof of the nightclub after its lease expired and the club negotiated a new lease with the other company.